A Catholic Life: What Does Papal Infallibility Mean? "Infallibility" is one of those doctrines the modern world has a lot of trouble accepting. Part of the problem is that some have mistaken the word to mean that the pope, who is a human being, is without error in everything he says and does. This is not what infallibility means. The First Vatican Council made clear that infallibility relates to the "office" of the Pope, not the man himself. When the Pope speaks "ex cathedra" or from the very seat of Peter, in order to define and defend matters of faith and morals, these teachings are to be believed by all the faithful. He speaks as the successor of Peter who was given this authority by Jesus. The pope speaks from a basis in Sacred Tradition and Sacred Scripture. To understand this better, we can look to the family unit as a microcosm of the spiritual world. The need for a "defining word" is experienced on an everyday level here. There are times when a parent must say, "I have made the decision and it is final." This proclamation is necessary to preserve the unity of the family. Without it, some members of the family would dissent and go astray. The family is split and the peace of the family is shattered until the head of the household makes a decision to clarify what is true, right and good. For over 1000 years Christianity was one family, one flock, under the guidance of the Pope, who is the Father and the shepherd of the faithful. But then the Patriarch of Constantinople rebelled in 1054. Five hundred years later, Martin Luther rebelled. Since that schism begun by Luther, over 25,000 new denominations have split off from the first splits, and more schisms occur every day. All of this dissension and division reflects a denial of authority. Yet, the one true Catholic Church has continued in an unbroken line from Peter down to the present. This is so, because Jesus promised it saying, "The gates of hell shall not prevail against it [the Church.]" No other institution in the world has preserved its identity and structure for 2000 years. The Church, beginning with the Council of Constantinople in 381, proclaimed that there are four marks which indicate her authority: She is "one [united under one God with one baptism in the Body of Christ], holy [as proclaimed by Christ], catholic [meaning universal], and apostolic [guided in a direct line from the Apostles as the first teaching authorities of the Church.]" Organization and structure within the Church reflect the orderliness and structure of God! 124. Q. What is meant by the infallibility of the Church? A. By the infallibility of the Church it is meant that the Church cannot err when she teaches a doctrine of faith or morals. 125. Q. When does the Church teach infallibly? A. The Church teaches infallibly when she speaks through the Pope and the bishops, united in general council. Or through the Pope alone when he proclaims to all the faithful a doctrine of faith or morals. 126. Q. What is meant by the indefectibility of the Church? A. By the indefectibility of the Church it is meant that the Church, as Christ founded her, will last till the end of time. St. Cornelius was a pope for two years from 251 to 253. He pronounced that those who had denied Christ in order to avoid persecution, could confess, do penance and come back to the sacraments. When the persecutions began again, Cornelius faced exile. During his time of trial, he wrote that each bishopric should have an exorcist. He died from various hardships endured during his exile. St. Leo the Great was the pope from 440-461. He clarified the doctrine about the two natures of Jesus-Jesus is both fully human and fully divine. St. Leo described this as a "hypostatic union." (Hypostatic means "personal." This is the union of two natures in one person.) This Pope also helped clarify the pope's role in speaking in union with St. Peter with the aid of the Holy Spirit. He is best known for convincing Attila the Hun not to invade Italy. He is a Doctor of the Church. St. Gregory the Great was the pope from 590-604. He came to be known as the "Father of Christian worship" for his dedication to the sacredness of the liturgy. He wrote music and Gregorian chants bear his name. He was especially charitable in caring for the poor. Pope Leo III named Charlemagne the Holy Roman Emperor on Christmas Day in 800. As a result of this joining together of temporal and spiritual, Europe was transformed. The first schools were started inside monasteries, ancient books were copied and preserved; advances were made in art, architecture and agriculture. Pope Urban II called for the First Crusade to defend the Holy Lands, and free the Christian in the east from persecutions by the Muslim Turks, in 1095. He also created the Roman Curia to help administer the needs of the worldwide Church. St. Pius V was the pope from 1566-1572. He called together a Holy League to do battle at Lepanto against the ships of the invading Muslims. He credited the victory of the untrained Christian sailors to the praying of the rosary. He instituted the feast of Our Lady of Victory which later became known as the feast of Our Lady of the Rosary. St. Pius guided the work of the Council of Trent. Pope Urban VIII announced that he would excommunicate any colonists in the New World who tried to capture and enslave the native people. Blessed Pius IX sat on the Chair of Peter from 1846-1878. He called the First Vatican Council in 1869 and that council outlined the doctrine of papal infallibility. He defined the infallible dogma of the Immaculate Conception. Pope Leo XIII wrote an encyclical to define Catholic social teaching, Rerum Novarum, defending the rights of the worker. He was a Marian pope, writing extensively on Mary's role in salvation history and the power of the Rosary. St. Pius X was the pope from 1903-1914. He spoke out against the rising popularity of the philosophy of "relativism" and called for a return to orthodoxy within the Church. He called for the practice of frequent communion. He published the first Code of Canon Law. Pope Pius XII was the pope from 1939-1958. He defined the infallible dogma of the Assumption of Mary. 5. 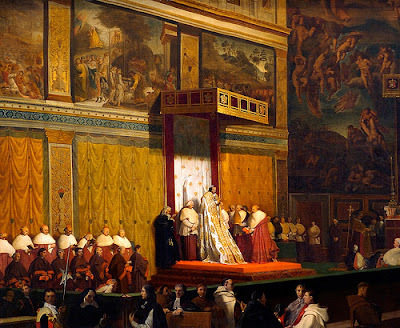 The Roman pontiffs, too, as the circumstances of the time or the state of affairs suggested, sometimes by summoning ecumenical councils or consulting the opinion of the Churches scattered throughout the world, sometimes by special synods, sometimes by taking advantage of other useful means afforded by divine providence, defined as doctrines to be held those things which, by God's help, they knew to be in keeping with Sacred Scripture and the apostolic traditions. 6. For the Holy Spirit was promised to the successors of Peter not so that they might, by his revelation, make known some new doctrine, but that, by his assistance, they might religiously guard and faithfully expound the revelation or deposit of faith transmitted by the apostles. Indeed, their apostolic teaching was embraced by all the venerable fathers and reverenced and followed by all the holy orthodox doctors, for they knew very well that this See of St. Peter always remains unblemished by any error, in accordance with the divine promise of our Lord and Savior to the prince of his disciples: I have prayed for you that your faith may not fail; and when you have turned again, strengthen your brethren. 7. This gift of truth and never-failing faith was therefore divinely conferred on Peter and his successors in this See so that they might discharge their exalted office for the salvation of all, and so that the whole flock of Christ might be kept away by them from the poisonous food of error and be nourished with the sustenance of heavenly doctrine. Thus the tendency to schism is removed and the whole Church is preserved in unity, and, resting on its foundation, can stand firm against the gates of hell. 8. But since in this very age when the salutary effectiveness of the apostolic office is most especially needed, not a few are to be found who disparage its authority, we judge it absolutely necessary to affirm solemnly the prerogative which the only-begotten Son of God was pleased to attach to the supreme pastoral office. 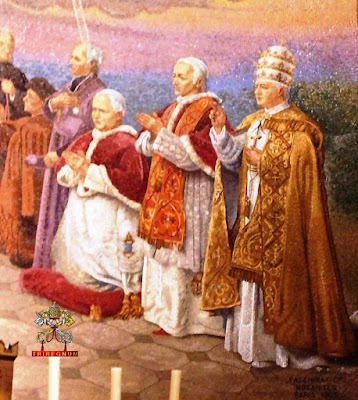 Given at Rome in public session, solemnly held in the Vatican Basilica in the year of our Lord one thousand eight hundred and seventy, on the eighteenth day of July, in the twenty-fifth year of Our Pontificate. "The [First Vatican] Council did not declare that the Pope cannot sin; neither did it declare that he can in no way err; nor that he cannot personally hold erroneous views in matters of faith; but merely that he is infallible, not subject to error, when he decides ex cathedra - that is, as Head and Teacher of the whole Church - upon matters of faith and morals." Obviously, on-the-spot interviews in a plane answering questions from journalists, or talking repeatedly to an older journalist who never recorded their private meetings, does not qualify as magisterium even though this is what secular media will mostly be about. Neither can daily improvised homilies at Mass. Popes of the past did not have their every word put to archives. And they wrote and talked much less. Truth is, the inflation of the pontifical verb slowly started with Pius IX and has accelerated with Pius XII and even more after him.